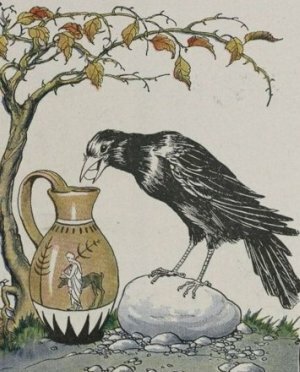 The Crow and the Pitcher - Listen to this famous Aesops fable online! The Crow and the Pitcher is a great fable about being resourceful! We'll have to be quiet as we approach so we don't scare the crow away, watch carefully! In a spell of dry weather, when the Birds could find very little to drink, a thirsty Crow found a pitcher with a little water in it. But the pitcher was high and had a narrow neck, and no matter how he tried, the Crow could not reach the water. The poor thing felt as if he must die of thirst. Then an idea came to him. Picking up some small pebbles, he dropped them into the pitcher one by one. With each pebble the water rose a little higher until at last it was near enough so he could drink. The Moral Is: In a pinch a good use of our wits may help us out. You know what to do, click the arrow to listen. What a smart bird! 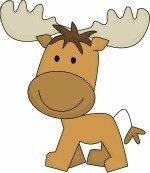 We can learn a lot from this fable. When you're in a jam - don't panic! Use your head instead. When we take just a minute to think through a problem we can usually find a solution. So next time you're stuck, think about the crow - what would he do? Did you know that crows are actually very smart in real life? They can even imitate certain sounds like a parrot! A group of crows is called a "murder"! That's weird!